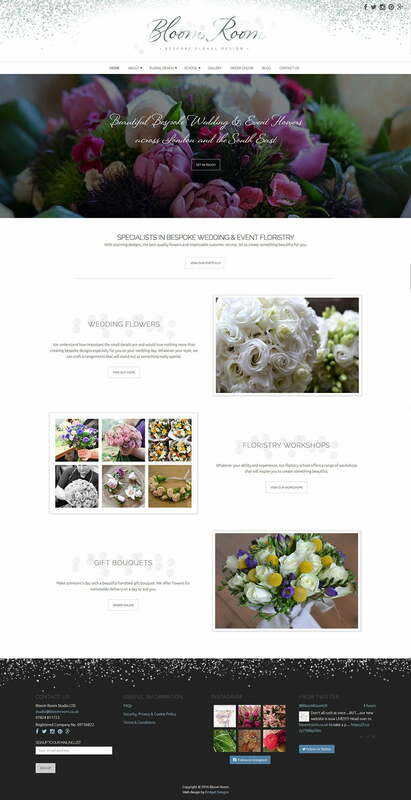 Bloom Room are a specialist, bespoke wedding and events florist based in West Sussex. They were looking for a high-end, stylish e-commerce website with a blog and images galleries filterable by season and colour. We achieved this goal through a clean, modern, sophisticated design, will bold use of photography and elegant fonts. The responsive website runs on WordPress so is completely manageable by the client. It features a full e-commerce shop with workshop bookings, delivery and subscriptions, a contemporary blog, grouped by month and filtered by topic, an events page, press section, and four beautiful galleries with an distinctive ‘filter by colour’ feature. The site reflects Bloom Room’s attention to detail and focuses on their exceptional products, while also promoting their workshops and events. As part of the project we also designed their logo and business cards.